So the WPS appears to be headed from blue and white to black and white. According to former dep. 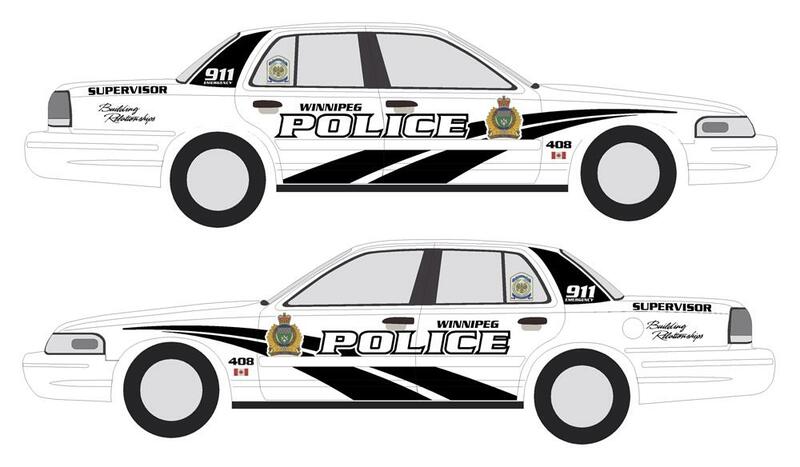 chief Menno Zacharias, the Winnipeg force is soliciting opinions from officers about their preference for a new design and colour scheme on their mobile offices. I think I like it. The black on white — especially with the ‘swoop’ logo — looks cool and powerful to my eyes. My only wish is that they were moving to the Dodge Challenger as the model for the cruisers. The proposed new slogan/motto, however: ‘Building relationships’ – I don’t know about. It sounds good in theory, but in practice? Let’s put it this way. If the force is so concerned about forging positive relationships with the public, why don’t they get a say in what the new design looks like? According to Zacharias, its police officers [and possibly civilian members of the force?] who get to weigh in on the plan. After all, it’s their tax dollars at work to pay for the initiative in the end. People love to feel included in things like this. No one’s saying the WPS has to listen to the public, ultimately — but at least remember it’s not just your officers who have to look at the cars as they swoop around the city. Come to think of it, I wonder where the idea for the new slogan came from? Hmm…. Kudos to Britt Harvey of the Winnipeg Free Press for a good look at this story in today’s paper. Anyone else agree that WPA president Mike Sutherland’s comments in the FP seem strange? He indicates the cars’ new colours will be more visible and improve officer safety. I thought it was those flashing lights and sirens that did that. Hard to miss them, even on today’s blue and white cruisers. Personally, not a fan of the black’n’white. For some reason, it looks… American to me. Which is probably just how my brain parses “familiar yet different,” but I like my cuddly ol’ WPS designs.